Hello, Friends! 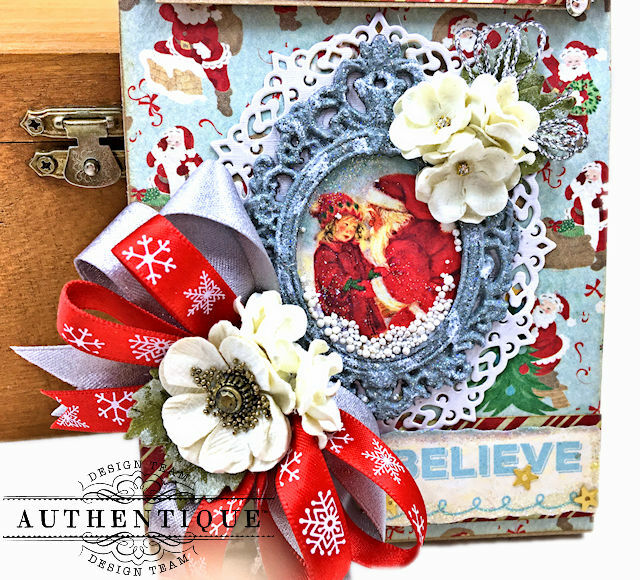 It's my turn to post some fun ideas for Christmas in July with Authentique Jingle. 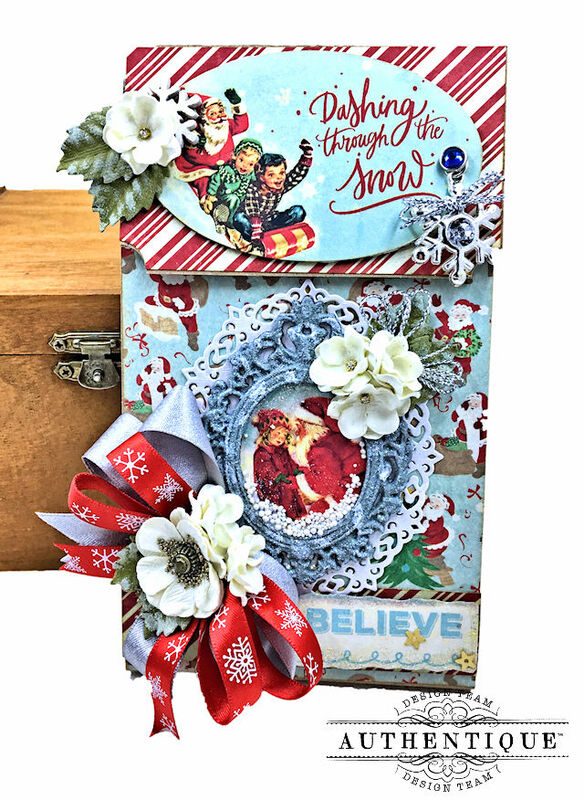 I had so much fun playing with this collection that I ended up creating 3 separate projects: a easy to make fancy fold card, a mini Christmas waterfall folio, and a trio of Gift Card Ornament Tags. Let's get started! Cards that can double as gifts are awesome. But cards that can be a card, a gift, and home decor...well those are fabulous, right? This fun Easel Step Card design falls into that category. I've seen these all over the internet lately. This design is slightly modified so that I could make one of my standard 7" x 5" cards. I used oversized 12" x 17" kraft cardstock to create this folded card base. 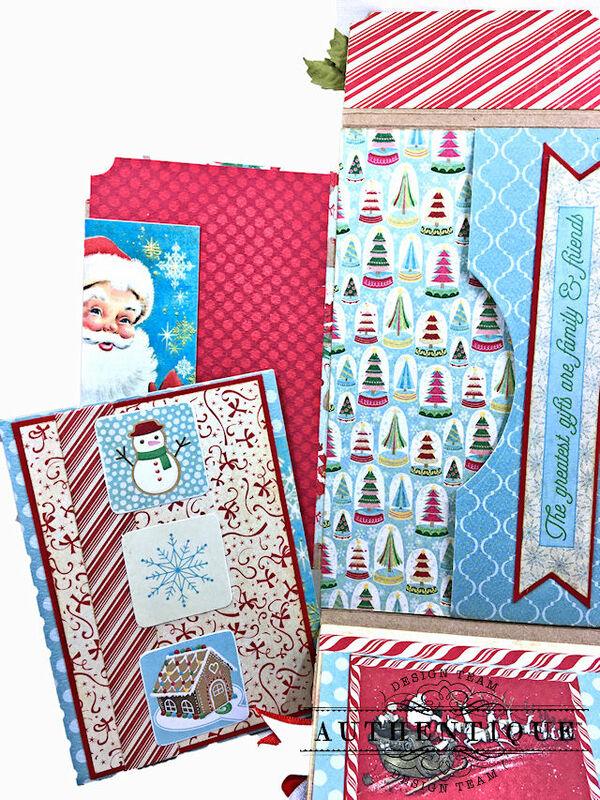 If you don't have any on hand, you can easily join together 2 pieces of kraft cardstock using Scor-Tape. Then just cut and fold following these directions. Trim to measure 7" x 17". Now, on the long side, score at 1 1/4" , 2 1/2", 4 5/8" 7" and 12"
Next, burnish all scored/folded lines thoroughly with a bone folder. Then, cut two 6 7/8" x 2" panels of complementary designer paper. Finally, cut two 6 7/8" x 1 1/8 panels of complementary designer paper. TIP: Keep the embellishments on the simple side so that the card will fold. For easy mailing, leave off the bow cluster. Now adhere the inner and outer layers to the card base. Trim the card focal from Jingle Eight. back with thin foam tabs. Center and adhere. 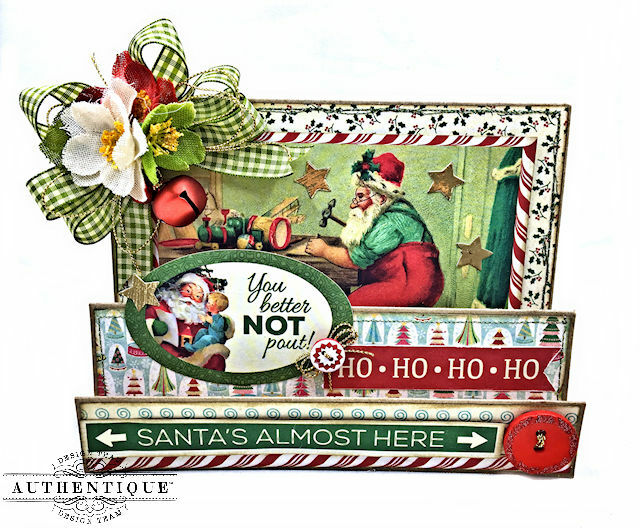 Now punch out the "You Better Not Pout" oval, the "Ho, Ho, Ho" border and the "Santa's Almost Here" border from the 12" x 12 Component Sheet. Sand the edges to give them a snowy appearance. Back with foam tabs and adhere. First, score a 3 3/4" x 17" of kraft cardstock at 2 1/4" , 2 1/2", 9" and 9 1/4"
Then, fold and burnish to create a vertical wallet with two 1/4" spines and a tab closure. Next, trim the short panel to measure 3 3/4" x 2 1/4". Now, cut 2 peppermint stripe panels to measure 3 3/4" x 2 1/4". These will line the tab closure. Next, cut 4 Jingle panels to measure 3 3/4" x 6 1/2". These will line the front and back covers, and the interior. I used Jingle One, Jingle Six, Jingle Two and Jingle Six. 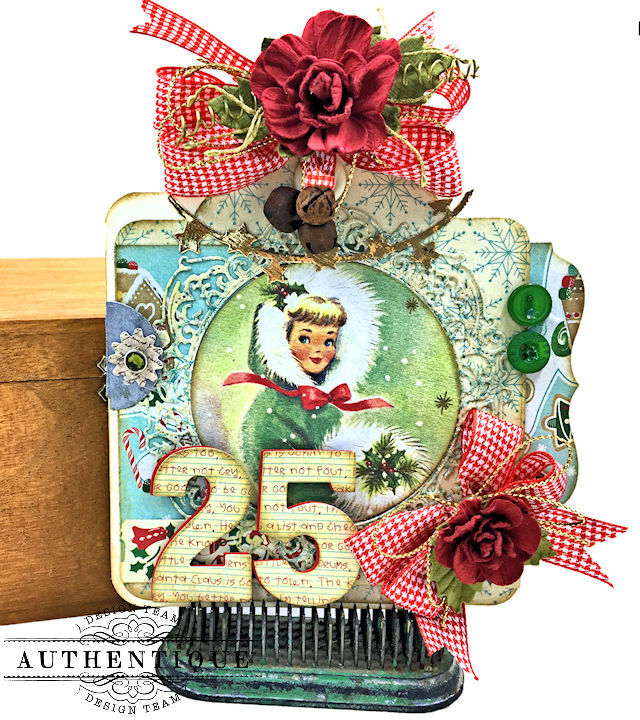 First, paint a Tim Holtz Baroque Frame with Iced Spruce and Picket Fence Distress Paints. Next, heat emboss the frame with Wow Neutral Ultra Shimmer Embossing Powder. Now, place the cooled frame over the component image and very lightly trace around the inside oval. Cut out the image about 1/8" wider than your traced lines. Erase the lines. 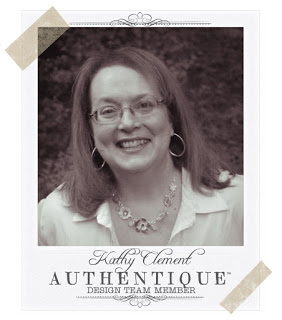 Next, mat this image inside the Tim Holtz Foundry Frame. Then, die cut a doily with a Spellbinder Oval Majesty Die. Adhere the frame to the doily. Now, sprinkle some Mini Pearls Prills to resemble snowballs. Adhere a double layer bow tied with RRR Shell Grey Shimmer Satin Ribbon and Snowflakes on Red Satin Ribbon. Finally, add Little Birdie Renae Classic Flowers. Tap the leaves with Picket Fence Paint to resemble snow. The inside of this mini waterfall folio is very, very simple. 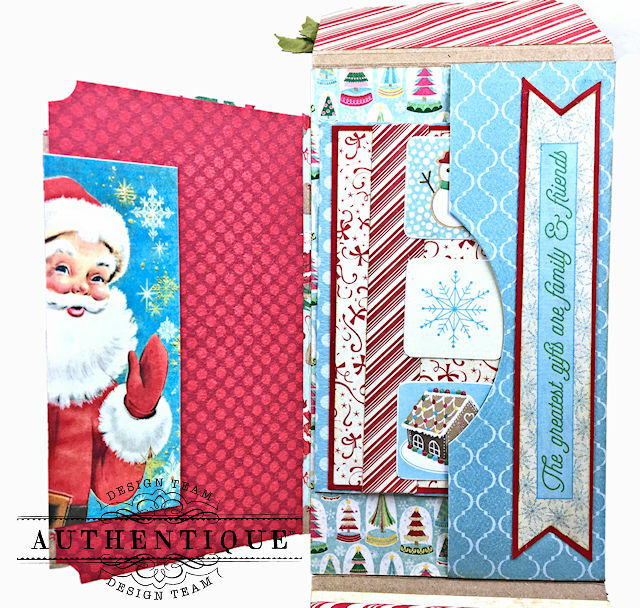 You can't add a ton of embellishments or layers because the cover won't close. 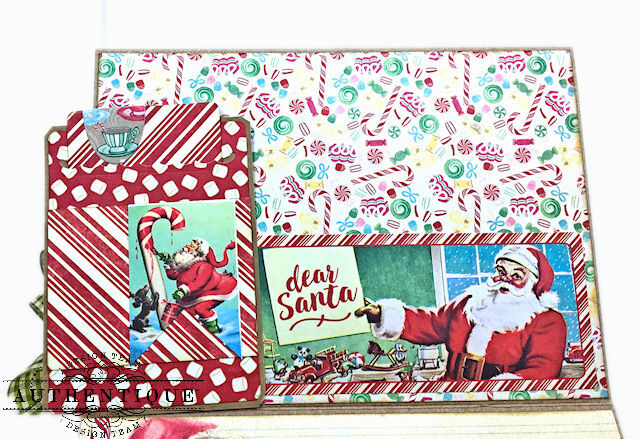 To stretch my designer paper, I used Authentique Spectrum Cardstock (Robin's Egg Two, Red Licorice One) to create flaps, pockets and the waterfall. Create a little flap/pocket on the top. 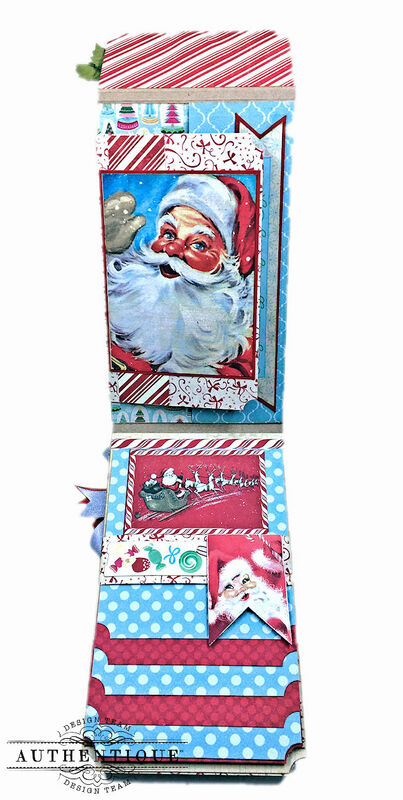 Use your scraps to create a little gift card wallet. Cut the Spectrum Cardstock to measure 3 1/2" x 4 1/2". I used a Corner Chomper Stub Punch to shape the corners. Then score a 1/2" flap on the top of each panel and adhere them to the base. Cut an 8 1/2" x 1" strip of Jingle Six to serve as a belly band. To do this, I wrapped the belly band around the waterfall and folded. Then I adhered the belly band to the base of the folio. Add magnets as a closure. 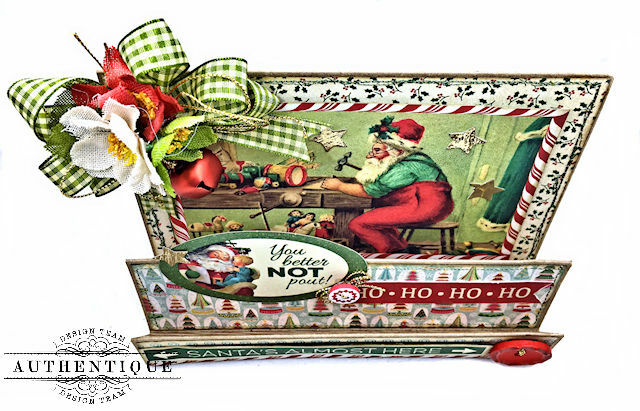 Since so many of us give gift cards at Christmas, I knew I wanted to create some sort of super cute gift card holder. Then I thought about handmade ornaments for the tree. And what about gift tags? 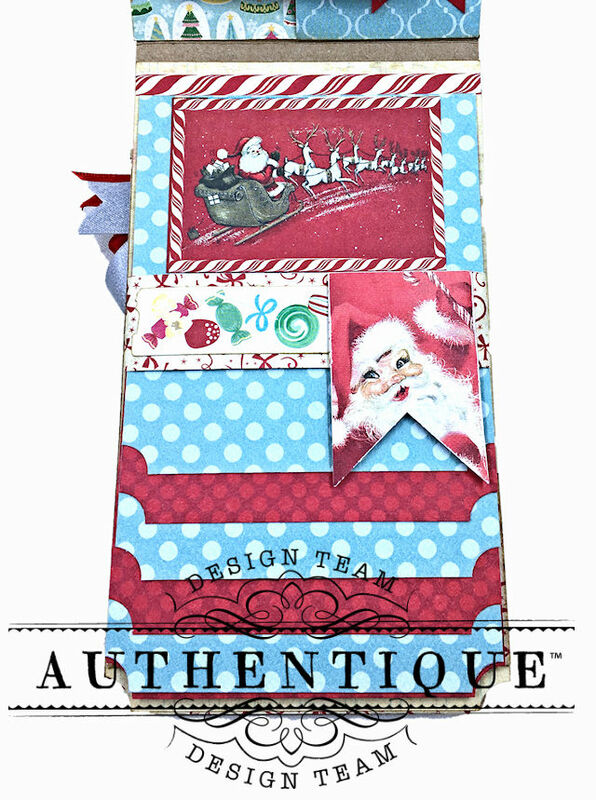 So I kind of threw all these ideas into the hat and came up with these festive Gift Card Ornament Tags. So, so fun (and easy) to make! Since I created a video tutorial for these tags, I won't go into a lot of detail here. I'll just show you the cute pictures with a quick comment. Each tag has a ribbon/button hanger on the top. I could see these hung on a tree, or strung on a banner or stocking hangers. That way , they are also home decor. The reverse side of each tag has a cute little gift card holder. 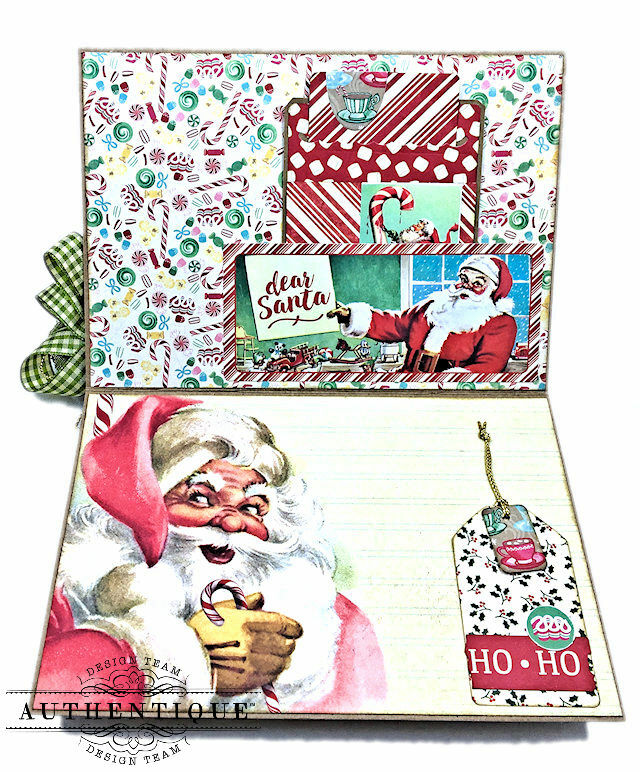 These are made with Eileen Hull's Credit Card Sleeves and Tags Dies from Sizzix. This is the tag we will make together in the video tutorial. I've used the G45 Square Tag and Clock Dies on all these tags. So are you ready to get your craft on? This video has a short overview of each project with tips and tricks to help you re-create them. Then there's a full tutorial for the final tag. Enjoy! I hope I've shared some tips and tricks that you can use in your own crafty adventures!